Please make these: they're amazingly good. 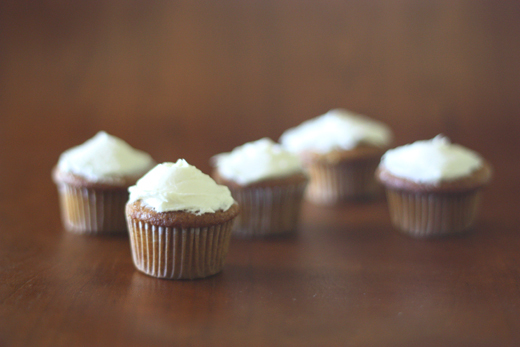 They're warm with ginger and spice, soft, and they're great as tiny little cakes, which is how I made them. 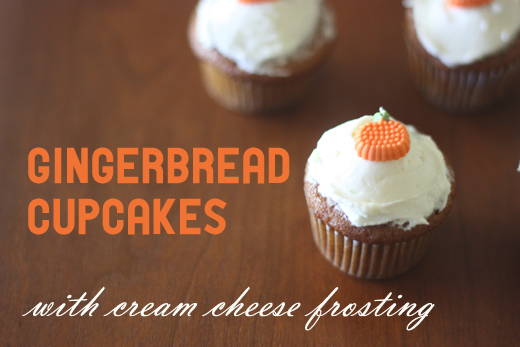 The cream cheese frosting is so phenomenal that I'm going to give it its own post, just so I can find it easily in the future. I took them to a party and let people ice their own cakes; the kids liked them plain, the grown-ups were all over the frosting. One of my friends took the leftover frosting home and "ate it like a pudding". The original Martha Stewart recipe uses unsulphured molasses, which I don't love; I substituted golden syrup, which still gives a fantastically gingerbready flavour. I know golden syrup is less common in the US, but I've found it for sale in both the groceries stores near me in Austin. Heat oven to 350°F / 175°C. Line muffin tins (mini or otherwise) with paper baking cups, and set aside. In a small saucepan, bring 1 cup water to a boil. In a bowl, combine boiling water and baking soda; set aside. In a large bowl, sift together flour, ground spices, salt, and baking powder; set aside. In an electric mixer fitted with the paddle attachment, cream the butter until light. Beat in the brown sugar until fluffy, 1 to 2 minutes. Beat in the golden syrup, baking-soda mixture, and flour mixture. Beat in the eggs. Fill the cupcake papers three-quarters full. Bake cupcakes until a toothpick inserted in the center of them comes out clean, about 25 minutes for ordinarily-sized cupcakes, or 15-20 minutes for mini cupcakes. Let cupcakes cool a few minutes, then transfer to a wire rack to cool completely before decorating. That little pumpkin it so cute on top! Where did you get it? Or did you make that cutie too? Hi Jeanee! The pumpkin is from Target - so sweet, isn't it? I bought it around Halloween. These are so adorable. I really enjoy the minimalistic styling of your photos as well. where is the creamcheese frosting recipe? All text & photos © 2009. If you'd like to reproduce my images online, please include a link back to O Pistachio.